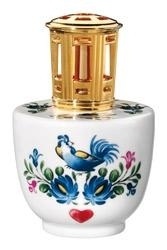 Chanteclerc is a rooster lamp from Lampe Berger that would like a home in your kitchen or den! A wonderful French provincial classic, it is even nicer that the first rooster lamp. It comes with the heavy top in a nice gift box with the a burner, funnel and instructions.